Nora Desmond worships herself on the screen. Sometimes we (as in, yours truly) think we’re pretty smart. We think that if we’ve seen a movie a dozen times we know the movie. Ask us a question! We’ll give you the answer; we know it all! We were reminded of this recently when we saw the 1950 film noir Sunset Boulevard in an actual movie theatre. Now, we’ve probably seen Sunset Boulevard on our television a dozen times. We own the DVD. We force our everyone we know to watch it. We can quote entire scenes by heart. But when we saw it on the big screen we realized we didn’t know it at all. Seeing it in the theatre changed the movie for us. If you’re not familiar with Sunset Boulevard, it is the story of a struggling screenwriter (William Holden) whose car breaks down outside the cavernous home of a mentally-unstable recluse (Gloria Swanson). Turns out this recluse is Norma Desmond, who had been one of the most popular movie stars in the world during the silent era. The movie is a series of flashbacks that describe the events leading to a murder. It’s also the story of old Hollywood and offers an interesting look inside the workings of a major Hollywood studio, in this case, Paramount Pictures. We thought we knew Sunset Boulevard. We were familiar with the script and the sequence of events. But, as it turns out, we’d only ever seen half the film. Because, on the big screen, the movie is stuffed inside Norma Desmond’s house. Instead of fitting the story comfortably on our television screen, we are pulled entirely into the movie, into Norma Desmond’s enormous gothic house with the heavy, funereal decor. The house becomes more than a set; it is a looming, silent master with knowledge it will not share. We are no longer an audience in a theatre; we are prisoners in this house. The actors are its prisoners, too; captured by the world Norma Desmond has unwittingly created for herself. We respect Norma’s silent film career; we are weary of her narcissism. We admire her determination; we are annoyed by her neediness. We love Norma. We hate Norma. Her descent into madness is magnified on the big screen, in this house that is both a tribute to madness and a betrayal of it. The final scene of the movie is utterly brilliant and completely devastating. The words, “All right, Mr. DeMille, I’m ready for my close-up,” twist inside of us. We do not laugh at this now-flippant phrase; we nearly weep because it signals finality. There is no turning back from here. When the movie concludes, we do not stir. We have seen what madness looks like and it leaves us unsettled. When we finally leave the theatre, we squint in the bright sunlight but the images of the movie remain to haunt us. Sunset Boulevard: starring William Holden, Gloria Swanson, Erich von Stroheim. Written by Charles Brackett, Billy Wilder, D.M. Marshman, Jr. Directed by Billy Wilder. Paramount Pictures, 1950, B&W, 110 mins. Interesting background info on Sunset Boulevard can be found at the Wikipedia article here. I have yet to see this awesome film on the big screen and I have to admit that I am quite jealous! We haven’t even seen this movie before (please don’t tell anyone), but now I think we need to see it on the big screen before we watch it at home. I hope one of Madison’s downtown or Chicago’s (classic-friendly) theaters comes through for us and shows it this year. I have to see it! Funny. As I read this post’s title, I thought how this is one movie that I wish I could see on the big screen — and then I read the opening to your post. You summed up perfectly why going to the theater is so much more engrossing than watching a movie “on demand” at home or, worse yet, on a smart phone. (Do you believe that nonsense?) In a movie house, you experience a film. At home you watch it. Thanks, John. And yes, I shudder to think of watching a movie like this on a smartphone. Perish the thought! Another classic I haven’t seen. Great write up! I really enjoyed this post! Thank you. Sounds like I need to see this film again on the big screen! I don’t remember when I first saw this movie but the feel of it permeated the part of my mind responsible for dramatic daydreaming. From time to time I go googling for good movie stills of the set. I’m always disappointed with what I find. Guess there’s no substitute for the actual work. You’re right about the stills from the set – they really don’t do justice to the real thing. The set really is a thing of genius. I adore this movie. It is one of the best films ever made. But I’ve never seen it on the big screen so I can only imagine the experience through this wonderfully-expressed entry. And if I sound as if I no longer know how to write in English it is because you’ve moved me. That flippant ending has never made me laugh, it’s always been tragic to me. I can only imagine. Thanks for sharing this. Thanks for your kind words, Aurora. I hope you get the chance to see this on the big screen. I would love to hear your thoughts on it. The second time I saw Sunset Boulevard was on the big screen. While I obviously didn’t know the film as well as you did going into the theater, I can’t help but agree with every word you said: it became a whole different movie. One other thing I know is that I’ll never forget that how the final shot looked on the big screen. You’re right! That final shot is utterly haunting. Gloria Swanson was brilliant. Very interesting piece, Ruth! 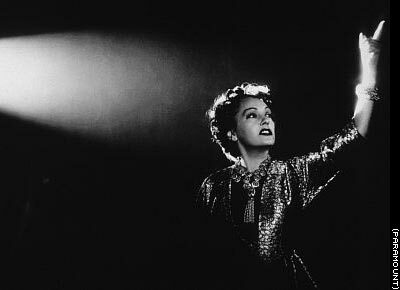 Though I haven’t seen SUNSET BOULEVARD all the way through, I do know what you’re talking about re: seeing new things in old favorites when you see them properly presented on the theater screen. Classic black & white films take on an added depth and solidity when you see them as they were intended, and as you say, things pop out at you that you may have missed in several home viewings. I like how you point out how the house set in SUNSET really came alive for you, drawing you into the spell of the movie. That’s the way it should be, when it’s done right. Thanks for dropping by, Jeff. Yes, that is a great thing about movie houses that show the older classics – it’s like seeing them again for the first time. Sadly, though, it can have an adverse effect – the first time I saw “A Streetcar Named Desire” was at a movie theatre that showed these classics once a month; when I saw it again on television, I just didn’t like it as much. Ruth, your moving, brooding review of SUNSET BLVD was beautifully written, and poignant indeed. Although I’ve never had the privilege of seeing it on a big screen as the movie gods intended, you really pulled me into poor mad Norma’s world. On a more personal note, I’ve had loved ones and friends with mental illnes, and they’re not so far from Norma’s fate. Most impressive, my friend! Thanks for your kind words, Dorian. Hopefully Sunset Blvd will come to a theatre near you! I’m sorry to hear you have loved ones that have to battle mental illness. It really takes a toll on loved ones and caregivers, doesn’t it? Hans Dreier designed the look of the film… You’ve captured his work here perfectly, his sets aren’t only evocative of character, they become additional players on the screen. The house truly is an additional character and I didn’t fully realize it until I saw it on the big screen. His work was genius!